Kickstarter FAQ # 444: Why aren’t you just looking for a publisher? A: TL/DR; my goals are different. I simply wrote “the prickle grass”. They were reminiscent of the long, twisted horned grasses the were often on the edge of the beaches up north. The Three went through a lot of transformation. I deviated away from the initial sketch, thinking perhaps they would be friendly and helpful. As their conversation with Tama panned out, I realized their intentions are far more self-motivated. It’s lonely out on the edge of the Great Sea, and they wouldn’t want anyone to else to get away. I went back to the drawing board, looking at more creepy eyes. Other characters have deliberately big, human-like eyes to make them friendly. The Three needed more animal eyes that were more disturbing. I studied the eyes of insects, birds and fish, which look fra more alient and menacing when you look at them closely . The final results are one of my favorite characters in the book — with their ubiquitous thorns, beady eyes, and enormous size — they tower over Tama. My kids both get creeped out by the final image, and now there are four images that include them. Tayoki and the Niwaki were an early addition to the story. I suppose the idea of a “wise old tree” trope is fairly hackneyed at this point, but I didn’t mind. I needed something that would make sense existing as ubiquitous as the grass, but older and much larger. It just made sense that on the edge of the valley lay a grand old forest. The trees are the elders, and though they can’t move from where they stand, they are strong and can talk. So all the creatures of the valley come to them for advice. I pointed out quickly that they listen. I get down to the ground and look my boys in the eyes whenever I can. The trees instead use their branches to lift their visitors up right to where they can see them. That was always the point in time I wanted to illustrate, though I went through various iterations of showing either just Tayoki or other trees as well. Before I got the suggestion to name the characters, Tayoki was simple the “Great Old Tree”. I had come up with many other names, like Ganshiki (insight + tree), Mitouki, (“unobstructed perspective + tree), Dosatsuki, (wise + tree), — all were a little too hard to pronounce. Oki (big tree) was easier but this tree was more than just “big”. The name Tayoki is a mash up of two kanji: “頼” tayoru (trust), and “木” ki, (tree). The meaning fits well. He is the tree that everyone trusts with their stories. …It took a few tries to get to the end. But I had a helpful crew! The dandelions were an idea early on in the book. Right from the start I knew that Tama was run into them, but it wasn’t until much later that I started to craft their personalities better. It also took me some study to really incorporate a more realistic lion face onto a flower. But at some point I found it — bushy manes, long hippie beards and more human eyes again for a more friendly appearance. Their leaves didn’t just sit near the ground, but instead formed arms. And there are three different “hairstyles” — the male bushy mane, the shorter hair for the females, and the younger ones with their more puffy look. These were some of the more time-intensive to draw, with their many many petals. The final drawing had over twenty of them, but it was worth it — the field of dandelions is one my favorites. 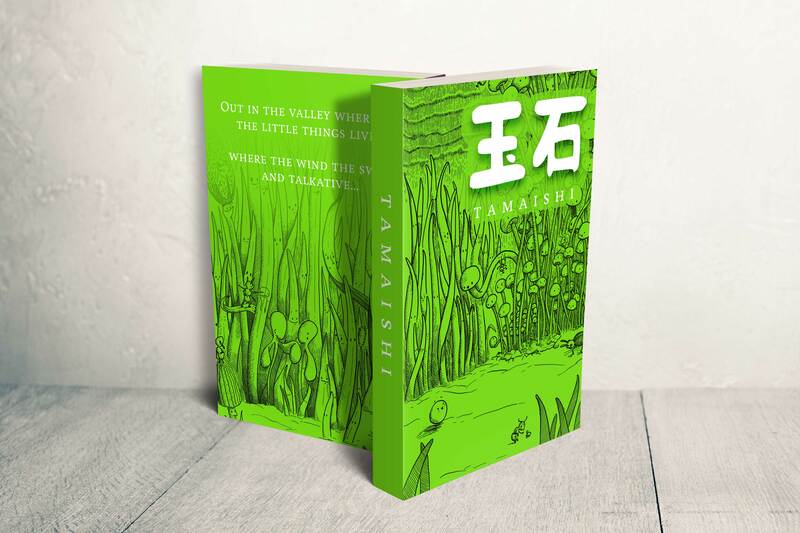 Every chapter of Tamaishi begins with a quote. This is chapter 4, where Tama tries to light like his friend Naio. I recently made the difficult decision to cancel the campaign for Tamaishi… But I’m not done yet. Last recording session, I got some feedback from Jon, who’s playing my main character. He was the little elephant Zōchi in my first book, and he was excited to come back to be Tama. He’s such a talent! Not only does he take direction extremely well, once he gets going he really gets into it! And along the way he gave me one really fantastic suggestion that I’m going to make a part of the story! … all 14,000 words of Tamaishi. While this isn’t my final design, it really helps me to see it in this form. It’s not quite this thick — only 72 pages! — but still, bigger than Zōsan was. I’ll be able to bright on some AstroBright paper (possiblyTerra Green 100C 14.8pt). The book will also come with a embossed dust jacket using the same paper. Digital printing has its advantages, but it’s always going to be toner fused to the surface of the paper, rather than ink within the paper… and that just doesn’t look or feel as good. It’s not as archival. So sure, it may be cheaper, but it can sometimes stick the pages together over time! I’m not knocking digital, it has it’s place, and it’s just not what I want. While there are cheaper offset printing options than I’ve ever seen before out there, they get those costs by outsourcing them overseas. That has its advantages, but I prefer to work with the people directly. I met the artists who run the presses for Zōsan, and they put their hearts and souls into every proof and print. And they’re here in the US. That means something to me. The quality of their work is impeccable.